'Ghosting' is a term being thrown around on the interwebbities a lot lately. Apparently it's the new way to leave a relationship without suffering the pain and embarrassment of actually having the "it's not you, it's me" conversation or writing the "Dear John" letter. I'd heard the term and filed it away under the "not applicable to me" category in the back of my brain. It all seemed a little cold and hard hearted when dealing with someone who has meant something (even briefly) to you. But then I had to rethink things a little when I saw a blog post recently entitled "I ghosted my own mother" on scarymommy.com. It opened my eyes to a whole new level of how we engage with others. This young woman had chosen to cut off all communication with her emotionally unstable and draining mother and was rejoicing in the freedom she now has. I totally understand the whole concept of dysfunctional family life and I'm sure she thought long and hard about it before she turned the cold shoulder and 'ghosted' her mum. It was probably a lot easier than having a big tumultuous showdown with someone who can't understand and doesn't want to change. I took the thought one step further and realized that I'd actually done the same thing when it came to a friend who proved to be less than a friend should. I never had the "throw down the gauntlet" moment when I confronted her about her actions or her motives. I never took the time to tell her how much she hurt and betrayed me. Instead I just shut down communications and didn't bother to contact her again - which translates to "ghosting" in all its glory. I assume she barely noticed and has moved on, and it saved a lot of anguish on my part. The only problem with ghosting is that it leaves a lot of things unsaid and unresolved. Neither party gets to have their moment in the sun. Neither gets to air their grievances. It's all neat and tidy and a little cold - just how we seem to like things nowadays. No mess, no pain and no resolution - just a ghosting and an end. 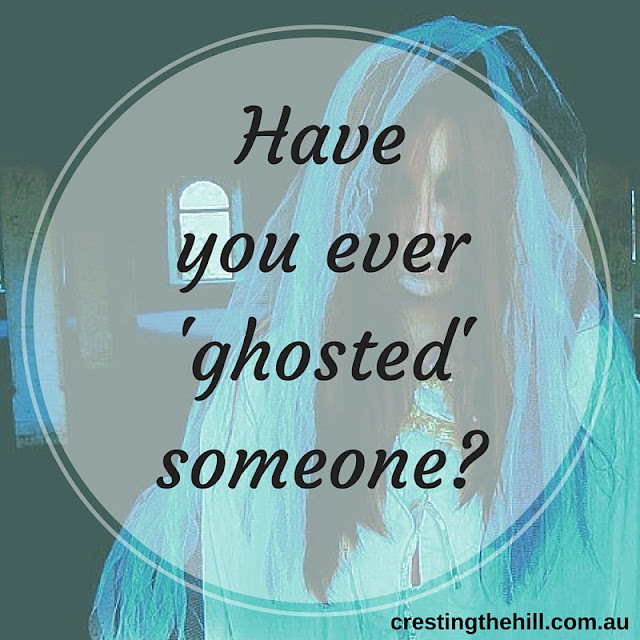 Have you ever ghosted a friend, family member or romantic interest? 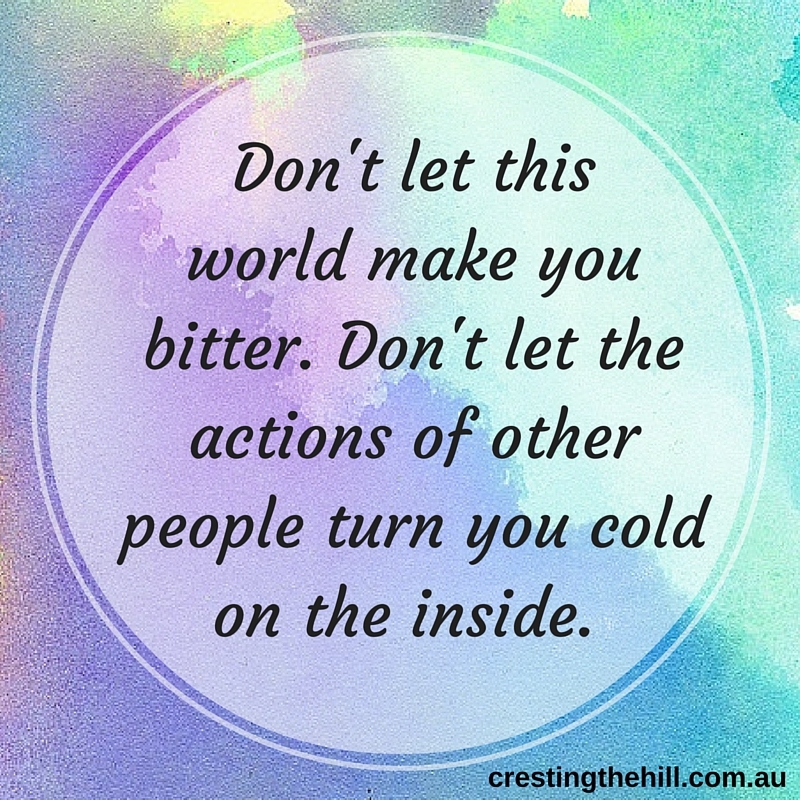 Do you think ghosting has a place in our lives or should we always confront those people who hurt us? [ Smiles ] Hmm. I definitely learned a new terminology today. I learned it a little while ago Renard - I think we'll hear it more often - thanks for stopping by! It's all part of the wave now. Kids texting each other, instead of having one to one communication. My daughter who is a teen doesn't like to talk on the phone but prefers texting. She says it feels awkward to talk... I guess I am just getting old... I don't understand these things. Me either Mary - I think our communication is getting less personal and it makes it easier to cut and run when the going gets tough! I didn't know about this term either. I think I prefer this to arguing as I've been known to always seek harmony. I prefer not to say certain things than to regret saying things that hurt. Thank you for introducing this new concept. it does put a bit more of a positive spin on the term doesn't it Abby? I must agree that I prefer to "go quietly into the night" rather than brawling! I've done this in the past myself. I'm not big on confrontations and would just rather cut off communication and be done with someone who does me wrong than get into a big dramatic fight with them. I've done the same thing with one of my brothers. I don't talk to him or about him and it's been that way for over 10 years. The phrase is new to me but not the concept, Leanne. Unfortunately, I've had to do this a few times too when I thought that clarification wouldn't bring closure. I've come to realize that we cannot always have closure, except in our hearts. I loved that "clarification wouldn't bring closure" part Corinne - we often talk things to death and achieve nothing in the process - silence might be a better solution. I read a great piece written by a woman who had been ghosted by a man she had been in an intimate relationship with, wish I could remember where and when I came across it, but what stayed with me was how unsettled it left her. They had been together and then they weren't. Zero communication, it was as if he simply disappeared off the planet. One could argue that his behavior proved he was unworthy of her affection but it seemed so unfair to her. Although I get that there are relationships where ghosting might in fact be the best solution, in her case it seemed so unkind. I think the heart deserves an explanation when intimacy is involved Elin. Ghosting might be a good way to deal with messy relationships that have been around the block one time too many, but when things have been good it's a hard way to be left with no explanation. I have never heard this term before. Very interesting. I am a very non-confrontational person, so I'm certain I have done this before in the interest of avoiding conflict. It's probably too much like taking the "easy way out," though. 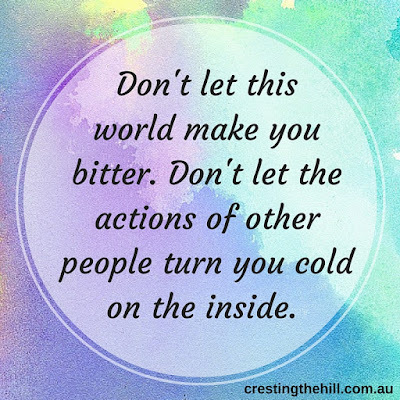 I think it is probably taking the easy way out at times Lisa, but it leaves room for resolution down the track if harsh words have been left unsaid - I think it's about protecting ourselves. I agree Lizzie - sometimes you have to say the words, and I think in deeper relationships like a lover or family they deserve it. When a friend doesn't behave like a friend then ghosting is an easier solution. I had heard this term and had decided that it truly is a cold and clinical way of handling the termination of a relationship. But, put your way, I realise that I, too have been guilty. I've never done the abrupt severing of communication, however. More of a gradual let down. But I still think it counts. Horrors! I felt like that too Diane, but after reading the comments I'm thinking it's something that we do as women when we don't want to go through the pain of confrontation. When the heart is involved it's wrong not to have the conversation, but it's different with hurtful friendships. I've never heard of "ghosting"; although I have to say, cutting communication with someone isn't a new concept. Funny how old things become new again with new terms. It is funny how something gets a new name and a new "personality" of it's own Mona - it's part of the morphing of our language I guess. I've never heard of 'ghosting' but I suppose it is just a modern term for ceasing communication. I haven't been close to my brother for years however he is now gravely ill. I have communicated with him which I'm glad to have done. Sometimes we don't get the chance. Thanks for sharing this new terminology with us at #WednesdaysWisdom although some things don't change no matter what they are called. That's true Sue - we just give things new names and apply them to different aspects of our lives - especially now that communication is always at our finger tips. Add me to the list that has never heard this term before. Sometimes, though, this may be the best way to end a relationship, especially if it's been taken over by "drama". I'm guilty of doing this myself! I think we all want to be as drama free as possible now we're a little "older and wiser" Lana and I'm starting to see that 'ghosting' has some advantages if used in the right context! Very interesting new term to add to my vocabulary! Can one Ghost and also Lurk on social media... I think plenty of people cut ties personally but still sulk and stalk, stewing over the decision to "cut out" the drama without resolution. I often wonder about unresolved stuff Jenn, but at the same time it's easier to leave without the confrontation and waiting for an apology is a waste of time too. I've done this with a couple of (former) friends. One lives locally so I run the risk of seeing her in person eventually. I wish I'd been brave enough to confront her on the things that were upsetting me. 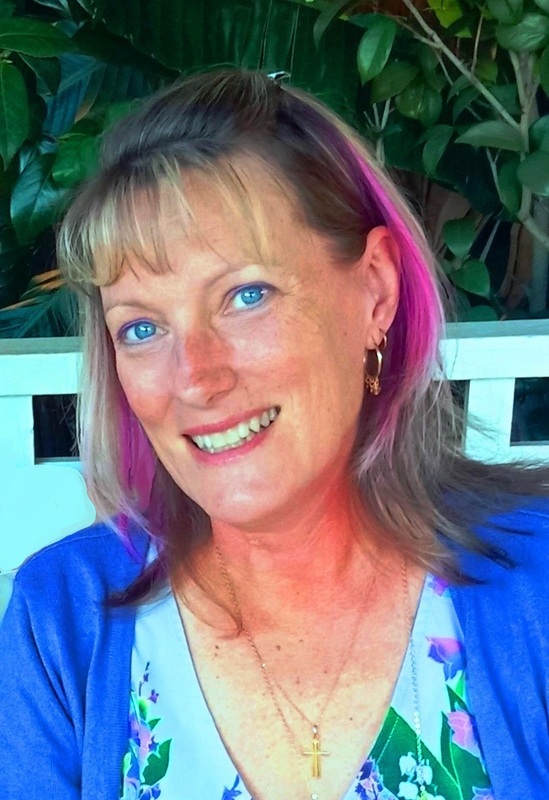 The other is more recent - she attacked me over something I said on Facebook, we had a bit of a spat about it over text messaging (we live some distance apart these days) and when the hubster saw some of her messages, he thought she was way out of line so I know it wasn't just me. So I cut her and blocked her on FB. However I haven't told her and as she doesn't go on FB much I don't think she even realises, as she still sent me Christmas and birthday cards! The friend I did it with is fairly local too but she doesn't seem to have noticed or cared, or tried to work out what happened to mend the broken bridge. So, ultimately it's hasta la vista and on to better things. Its' kind of funny how your ex-friend still sends cards - people have no clue at times!